Is Berkeley's New Build Pizzeria More Than Just a Gimmick? There's some value to its build-your-own setup, but the best pies are the house-made specialties. Build's array of sauces and ingredients are high-quality. If any cuisine has reached its saturation point in the Bay Area, surely Italian thin-crust pizza would be it. So it's natural that when hotel developers Lisa Holt and David Shapiro decided that their new downtown Berkeley restaurant would specialize in Italian thin-crust pizza, they wanted some kind of hook. Holt grew up in Rome, where she fell in love with Da Baffetto, an old-school pizzeria known for its long lines and simple, streamlined menu. She and her partner wanted to recreate something like those crispy Roman-style pizzas, but they also wanted a restaurant that would appeal to American individualism. So, they took a page out of Chipotle's playbook: What if diners could customize their pizzas, choosing from an array of sauces and toppings laid out in front of them? What if customers, could "have it their way" — but with high-quality ingredients and an upscale setting? At Build, the dining room is shiny and expansive, and the bar section — with its leather banquettes and reclaimed wood floors — looks nothing short of fancy. Huge black-and-white photos of (occasionally shirtless) twentysomethings in various states of ecstasy give the effect of a well appointed Abercrombie and Fitch. 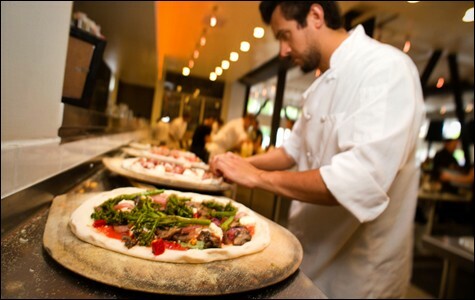 In the center, a brightly lit area marked "Building Department" — an open kitchen where the pizzas are ordered and assembled — is the focal point of the restaurant. It all looks and sounds very good. But the problem with turning the customer into a builder of pizzas is that the builder might not know what the heck he's doing. It's difficult, then, to evaluate a restaurant where the quality of the dining experience depends so much on the strength of the diner's topping-choosing mojo. Of course, the idea that you can pick what you want to put on your pizza is as old as pizza itself. The only difference is that at Build, you have to get into a line to do it. You pass a slip of paper with your name on it to the first pizzaiolo, who sets up the base of your pie — red, green (pesto), or white (sauceless). (A gluten-free dough is available for an extra $3.) The next member of the assembly line handles the toppings — some thirty or forty options, all laid out in little bins. Most cost a dollar apiece, with premium items priced higher. Once you've made your choices, you pay at the register. Is there some value added to the customer for having gone through that line? Certainly: You might see that the onions aren't as deeply caramelized as you like, or that the marinated peppers aren't the kind you prefer. Something you hadn't considered might catch your eye: the mushrooms, for instance, which were cut into chunks and roasted to a deep brown. But even having seen the toppings, you can't really know how well a certain combination will work — whether a salami you've never tasted will go well with a chili pepper you've never tasted. The best pizza I assembled was topped with salami, fatty cubes of smoked pancetta (my favorite of the proteins), and shaved fennel over a red sauce base — it would have been even better with a tastier tomato sauce and a more assertive salami. My worst creation, by far, featured zucchini and a scattering of tiny shrimp (a $3 add-on): bland, bland, bland. Apparently, salt and pepper aren't added unless you ask for them specifically. And, as small and delicate as the shrimp were, they were dreadfully overcooked after a couple minutes in the hot oven. The restaurant also offers several pre-set "house specialty" pizzas if you aren't in the mood for building. In the end, two of those — the Genovese (a pesto and mushroom combo) and the Piccante (pepperoni, roasted garlic, and fiery Calabrese peppers) — were better than any of the pies I put together myself. The line also led to timing difficulties. During both of my visits, my pizzas arrived at my table well before I did. One time I was held up at the "build-your-own" salad station — a discontinued feature. During the other, the cash register took uncommonly long to process my order. And table service tended toward awkward — servers asking if I was ready for dessert minutes after I'd started eating, or trying to take a drink order at the exact moment I was handed the drink menu. To be sure, the place has its charms: If there's no line, and you're decisive, you'll be digging into a hot pizza less than ten minutes after stepping in the door. 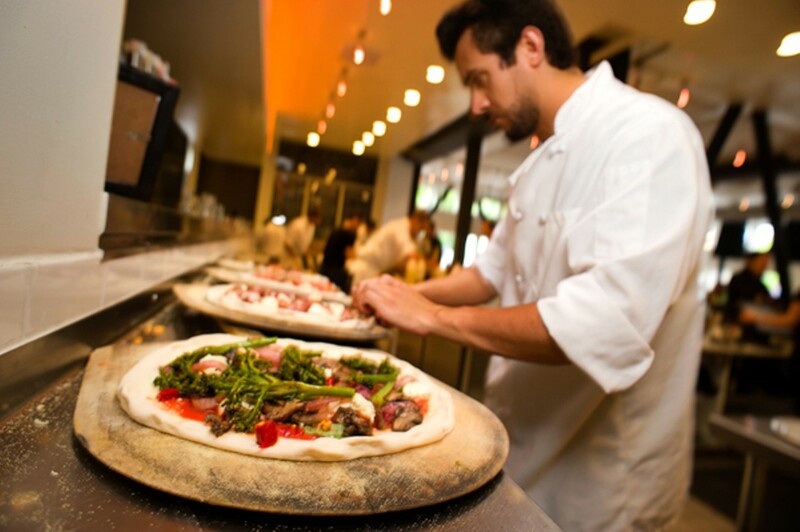 None of the high-end Neapolitan pizza specialists in the East Bay offer that kind of convenience, and no fast food pizza joint is firing your pie in a custom-built Italian wood-burning oven. And the crust, the one product by which a pizzeria lives or dies, is consistently good. It's a hybrid — not quite as thin as what you'd find in Rome, but baked longer than the tender, knife-and-fork Neapolitan style, so you wind up with a crispier pie that you can pick up with your hands. Aside from the pizzas, not much stood out. The appetizer menu was on hiatus during my visits. And both a Caesar salad and the build-your-own salad option were unmemorable, and skimpily portioned for the price. For dessert, a butterscotch budino was the lone standout — rich and thick, though perhaps a bit too sweet to enjoy without coffee. The restaurant is in the process of ironing out some of its kinks. The appetizer menu has been revamped. The pre-set pizzas and a seasonal pizza of the day can now be ordered from the table. Hopefully, the kitchen and the servers will get their timing down. And Holt is upfront about the potential for train wrecks: "I have personally created some real disasters on a crust." To mitigate that risk, Holt said Build has instituted a "pizza guarantee" — a no-strings-attached offer to fire a new pizza for you if you aren't happy with the one you've created.